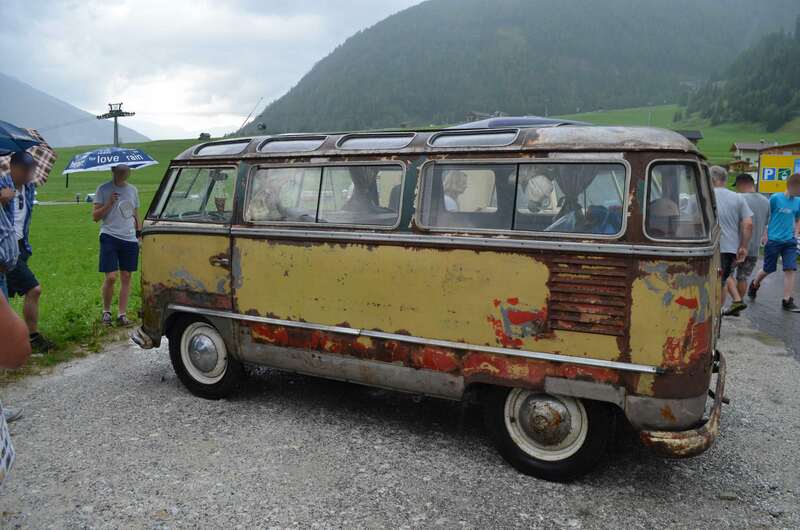 This blog post is all about a huge interest of mine: coachbuilders from Vienna that modified factory made panel VW buses (Type 2, Mod. 21) and added unique windows, deluxe trim and more. Some of these Volkswagen Transporter Buses looked quite similar to factory made deluxe buses „Sambas“ (Type 2, Mod. 24) at first sight. 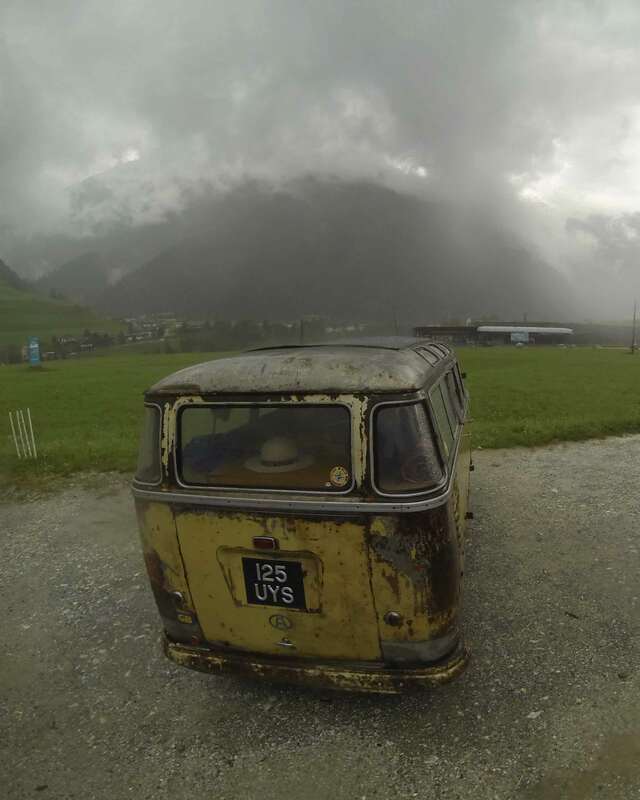 They were very popular in tourism back in the days and often used by hotels and bus travel agencies in the alps. Actually today the knowledge about those coachbuilders is very poor. The companies do not exist anymore, the workshops have been removed and most of the people who knew something don’t live anymore. The coachbuilder we still do know most about, is Hans Kohlruss. Hans Kohlruss was the owner of 3 workshops in Austria. After World War II he used parts of several cars and united them to build single cars that he made roadworthy again. The production has been made in little workshops by hand – not industrial. Mostly they didn’t build cars that looked the same – each one was unique. An exception is the „Kohlruss Käfer“ (= Kohlruss Beetle). This car is a combination of VW chassis (KDF or Kübelwagen – Typ 82) and the body of a Steyr 50 or 55. A handful of those cars still do exist. 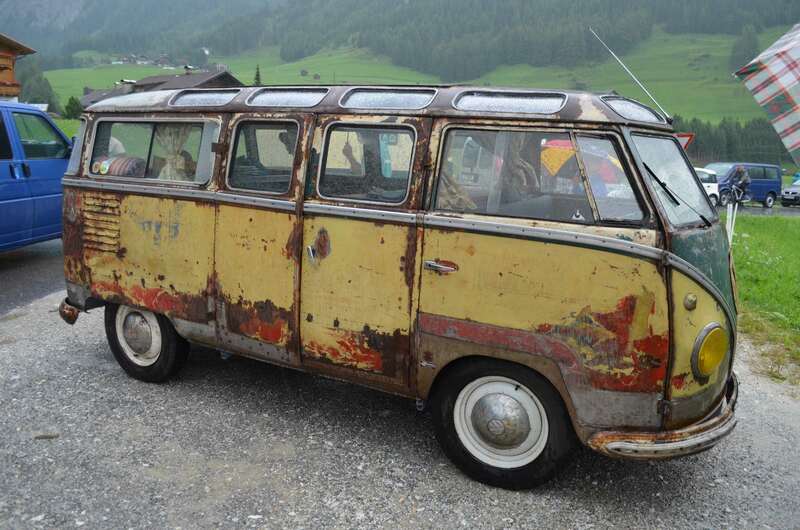 But what Kohlruss is mostly known for in the VW scene, are his barndoor deluxe buses. He ordered panels from Wolfsburg factory – sometimes with sunroof, sometimes without – and built very special buses. The most significant feature of such buses were 2 special built windows above the dashboard in the roof of the driver cabin. Some other characteristics were the long sliding windows on the sides – they enabled a better panorama view and an improved air supply. Somehow they are comparable to the later windows of baywindow buses (T2a & T2b from 1967-1979). It is not known, how many of those buses he built. I heard a rumour with the amount of 300, but can’t confirm it. 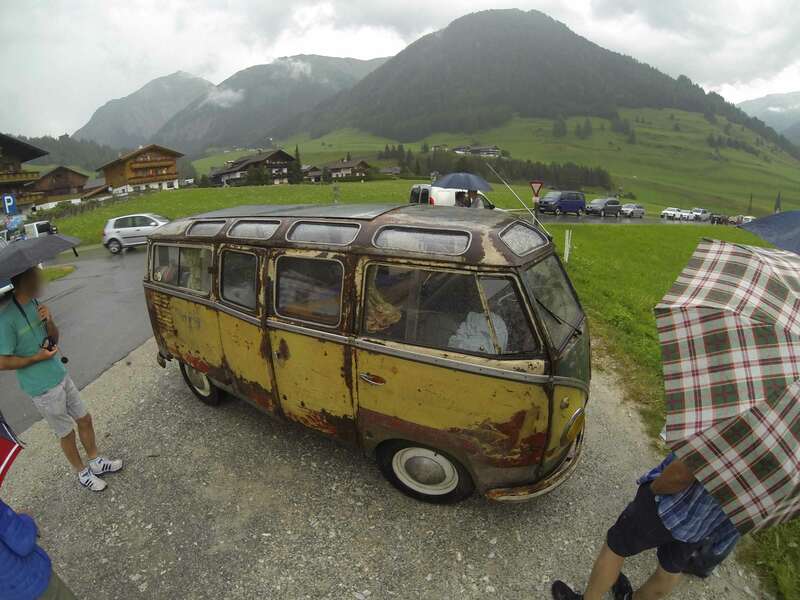 In 2012 a „surving“ Kohlruss Bus has been found in a forest near Villach, Carinthia – Austria. Currently this 1954 built car it is the only known Kohlruss VW Bus to exist. As you can see in the photos above, the condition of this bus wreck was very poor. 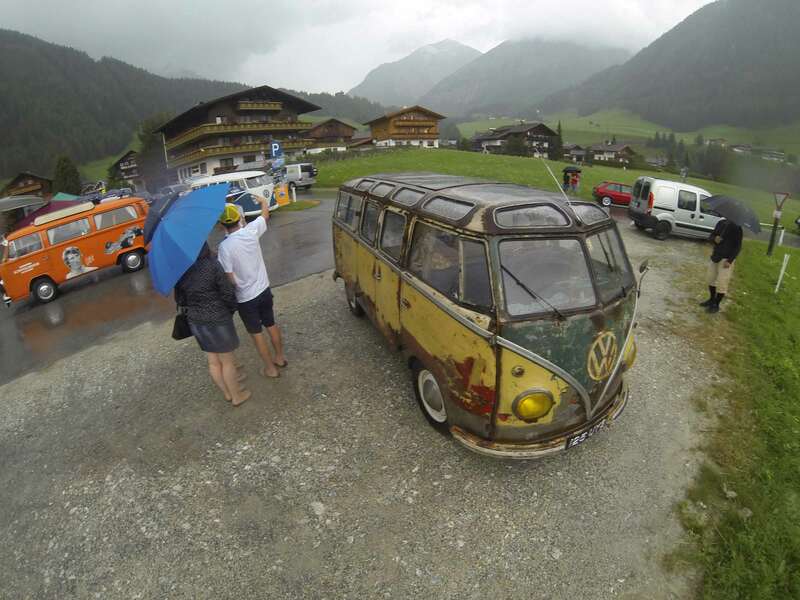 But thankfully two austrian VW Bus enthusiasts recognized the car and its potential & pulled it out. Two years later, in 2014, the Kohlruss Barndoor VW Bus was sold to United Kingdom and assembled piece by piece in a very impressive way. To everyone who is interested just a little bit in cars, i would recommend visiting the Kohlruss Restoration Group on Facebook. It was very important to the owner to use as much original metal as possible and to keep the original parts, so he added new metal to crumbly parts and was able to preserve them. 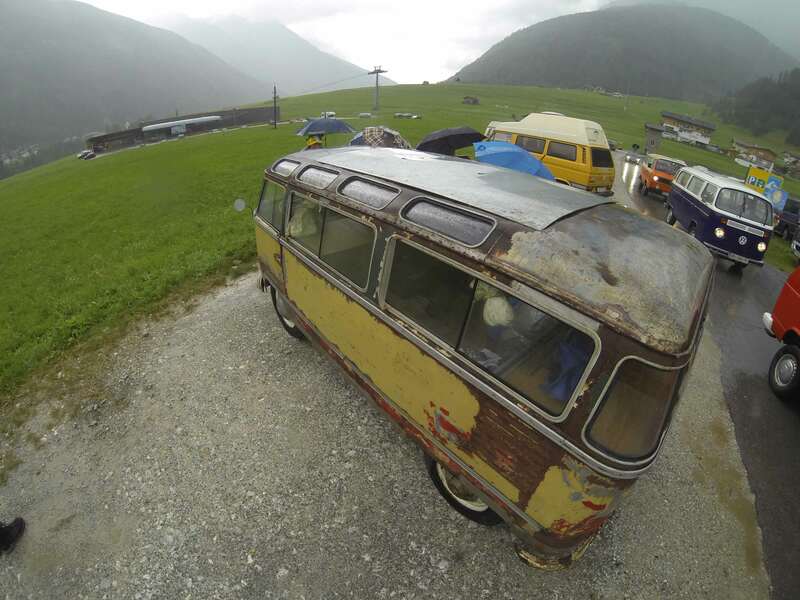 Believe it or not – two years later, in July 2016 – the same bus managed to drive to France (Super VW Fest, Le Mans) and to VW Bus Meeting „Bullitreffen“ at Kals am Großglockner in Austria – on its own axle and with its own power! That matched perfect, as the bus is austrian made and the alps were its natural habitat! 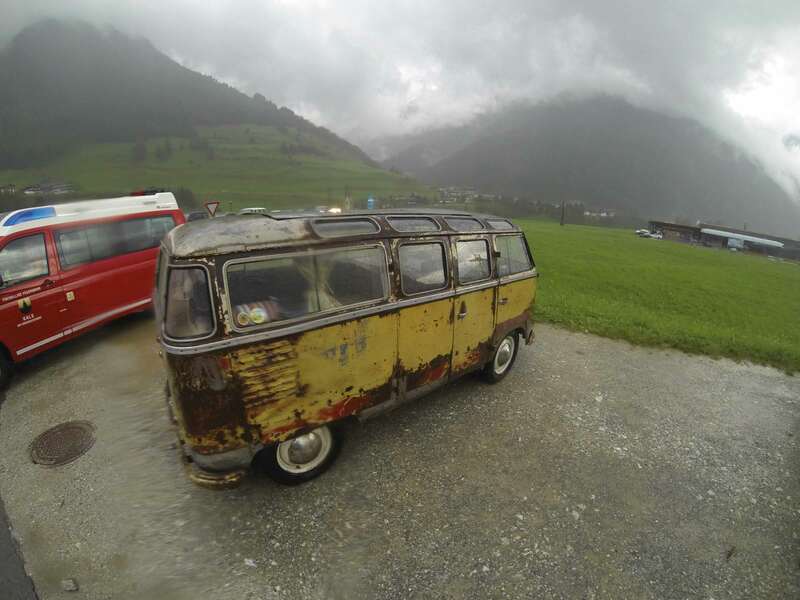 Sadly i was just able to visit this meeting on friday – i drove there for more than 5 hours (and also 5 hours back again) just to see this unique piece of a panorama VW bus. In famous TheSamba forum, i dedicated an own subject to Hans Kohlruss an his buses. There you can find several vintage pictures and other kind of collected information about his work. Another coachbuiler from Vienna was Karl Schreiner. His business existed from 1940 on until the early 2000s (?). Today we know very little information about Karl Schreiner and his cars is still available. Even more than about Kohlruss. What we know is, that he did coachbuilding work for „Zillertal Bahn“ (a train line), as well as for bigger buses – for example this KTM Motorbike Transporter, as the badge on the rear approves. 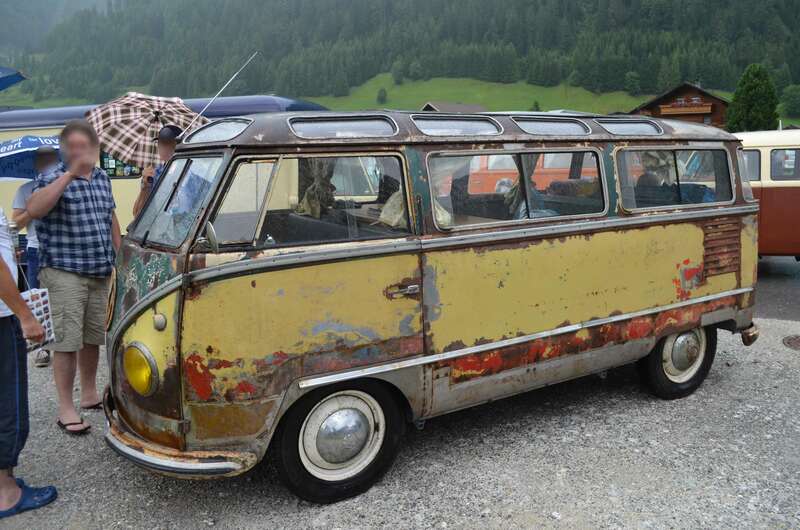 Similar to Kohlruss, he built Volkswagen T1 Barndoor buses – also with those two special windows at the front roof, but in many details his buses were different. Often the deluxe windows on the roof were longer. Another difference were the 3 windows on the side. They were longer than factory fitted windows, but shorter than Kohlruss‘. Also take a look at the long door at the passengers area. It was equipped with a wind-down-window! 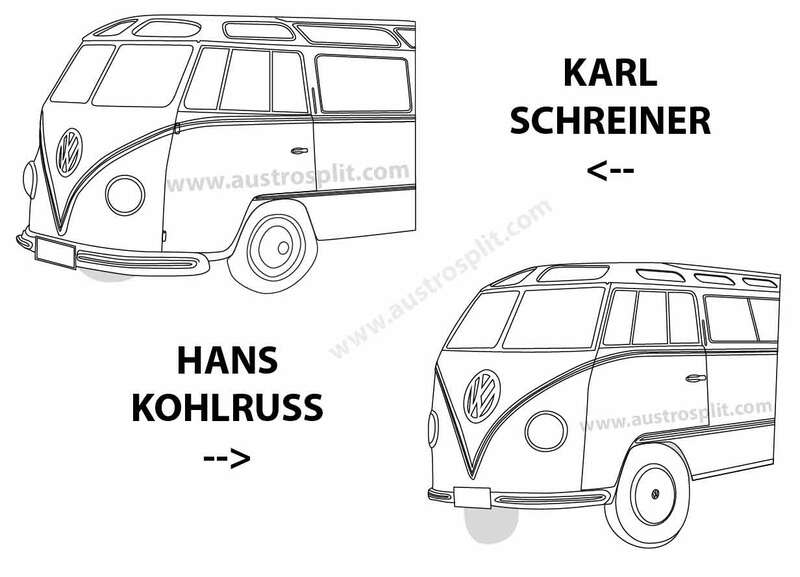 It is also proved, that Karl Schreiner built two Volkswagen Buses for „Horrak“ driving school in Vienna in about 1952. At the first look, you may believe it is a 15 window barndoor bus, but if you take a closer look then you will see that it is the work of a coachbuilder. I still have another picture showing this exact bus at Karl Schreiners workshop. My TheSamba thread concerning Karl Schreiner – click here. 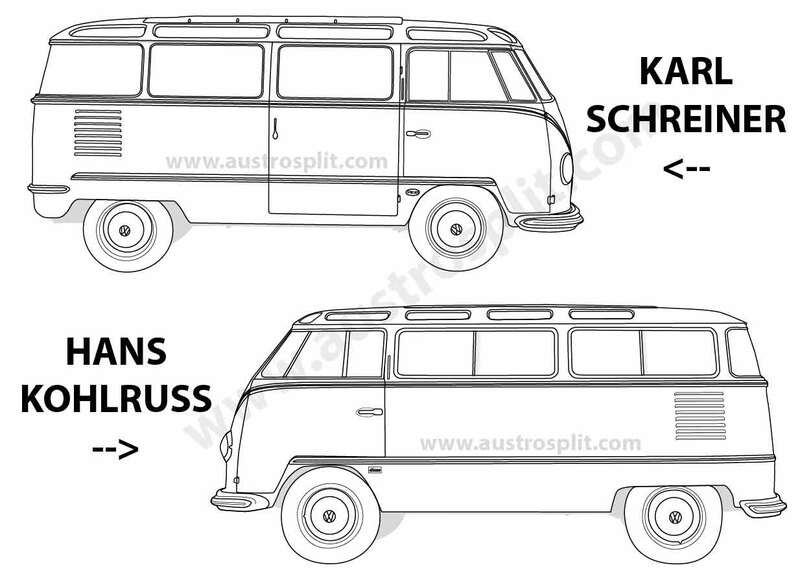 Some years ago i draw this sketch showing Kohlruss and Schreiner Barndoor Panorama VW Buses. i used old pictures that had similar angles. 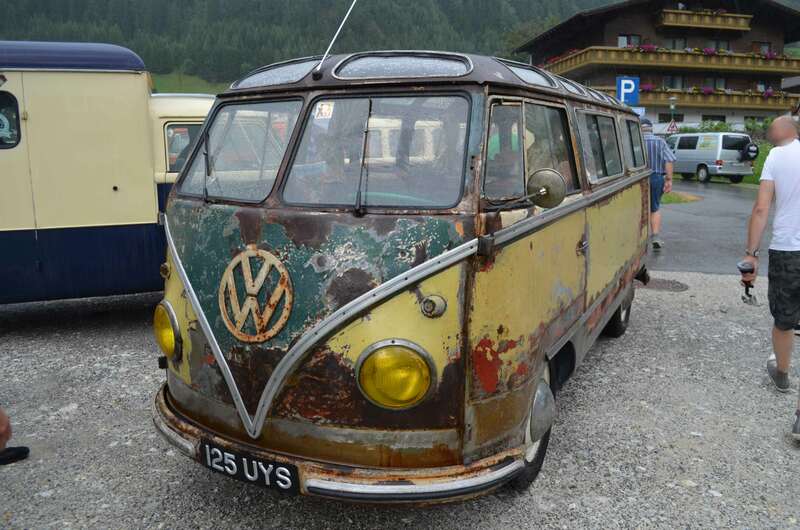 Other coachbuilders that also worked with VW Barndoor Buses were „Kastenhofer“ and „Weingartshofer“. But you can hardly find anything about them.. In this thread on thesamba i collected several other vintage photos of coachbuilt VW Barndoor Buses. But until now i don’t know which coachbuilder was their manufacturer. If you can help me, feel free to contact me! 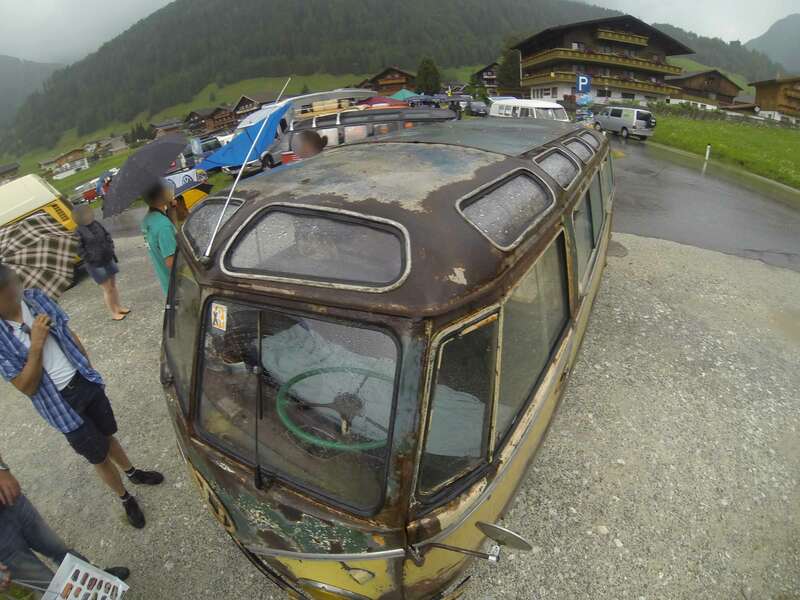 If you have any kind of information about such buses – no matter what it is – old pictures, surviving barn finds or old magazines please don’t hesitate to contact me. I would be very thankful!